Are you using subtitles addons to download subtitles for your movies? Then you must know that all subs from opensubtitles and other sites have various "signatures' like "Downloaded from..." or "Translated by", or much worse "Support us by voting..." etc etc. After a while it gets kinda annoying. Especially since some of the subs stay on screen for a long period of time. What this addon does is - parses the downloaded subtitles and removes the lines with advertisements or signatures etc. Then it displays the overlay for a few seconds confirming the cleaning was done. 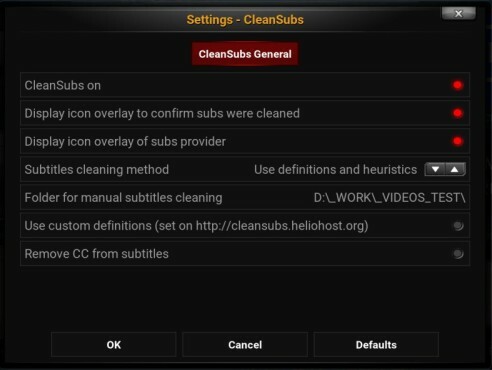 This service waits for the subtitles to be downloaded, it is monitoring temp folder for any changes in srt and sub files and then it "cleans" the subtitles file, and tells the player to use this new, cleaned file. Of course, this would not work without some kind of "definitions" - just like antivirus software has signatures - this add-on uses the definitions file to detect various unwanted strings. Also there is a "quick" mode which uses heuristic approach and is much faster - but the results don't have to be so good as with definitions. Anyway, the speed difference on my PC is like 0.65 seconds for cleanup with definitions versus 0.06 seconds for heuristics which could be relevant on slower Android boxes. The definitions are in several languages, and are downloaded automatically on KODI start from my web. That means all definitions need to be added to this one central place. So if you want to use this, send me the lines you want to add to the definitions - this way all users benefit from your work. New versions can clean video library too, as well as folder selected in settings. Also, there is the option to remove all CC (closed caption) subtitles. Anonymous statistics are collected for analysis purposes. Site with statistics (and a lot more!) is here. In order to install it, first install my REPO, then install add-on, no configuration needed.